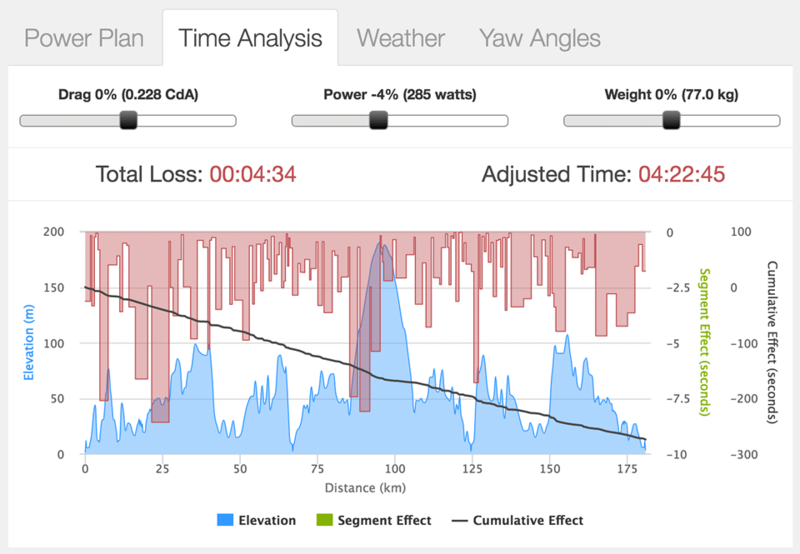 We now have the ability to vary Power, Drag, Weight and/or Rolling Resistance for any BBS model run and see the estimated impact to the race in real time. Best Bike Split has always been about planning, predicting, training for, and executing the perfect race plan. We found that many of our athletes and coaches were also using it to run what we call "what if scenarios". 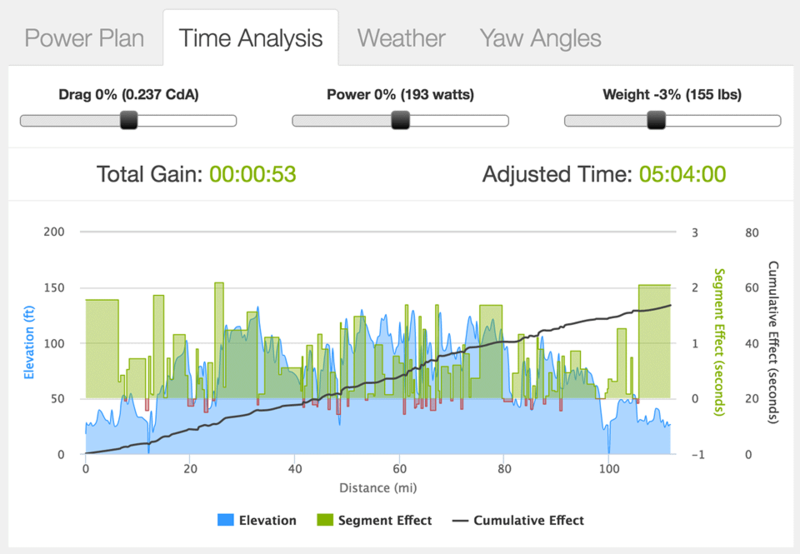 To help with this we added a weight adjustment field allowing users to make minor weight change before duplicating or updating a race plan, but we wanted to expand on this "what if scenarios" feature even more. In optimization math there is a concept called sensitivity analysis. It shows how much the outcome could change by adjusting a single variable (assuming all other variables stayed the same). While this is interesting, we wanted to go a step further by allowing real time adjustment of the three variables that tend to have a the biggest impact on an athlete's performance. 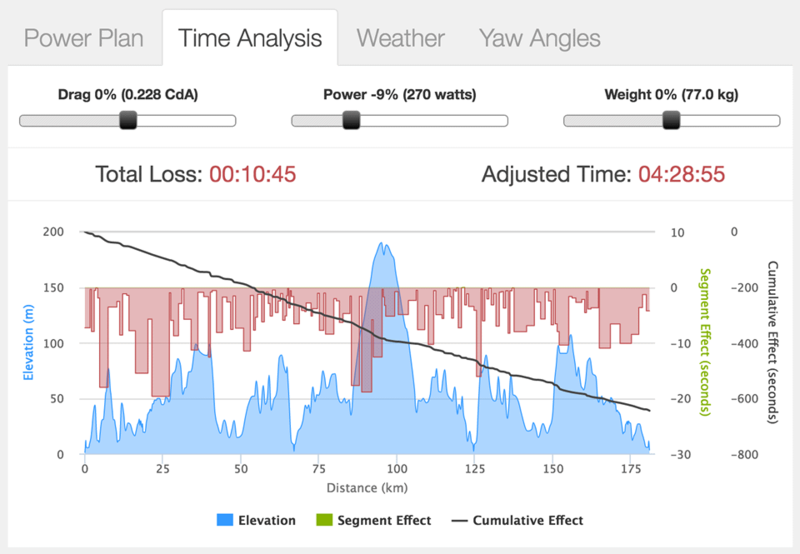 With our new Time Analysis tool we now have the ability to vary Power, Drag, Weight and/or Rolling Resistance for any BBS model run and see the estimated impact to the race in real time. It also shows where on the course an athlete will get the biggest gains or losses from these changes. The following discusses just a few ways we used the tool with Joe Skipper leading up to his 2015 Ironman World Championship race. Prior to the race Joe came to us with a couple of questions. The first was a question many strong cycling triathletes going to Kona have. "How much power do I need to break the bike record?" He then asked, "What type of times could I expect for varying power levels?". Running these scenarios is very straightforward in Best Bike Split, but it requires time to create a race plan then duplicate that plan multiple times with various power changes to see what type of times Joe could expect. The Time Analysis tool allowed us to do everything with a single model run and really help Joe understand what to expect based on power fluctuations. 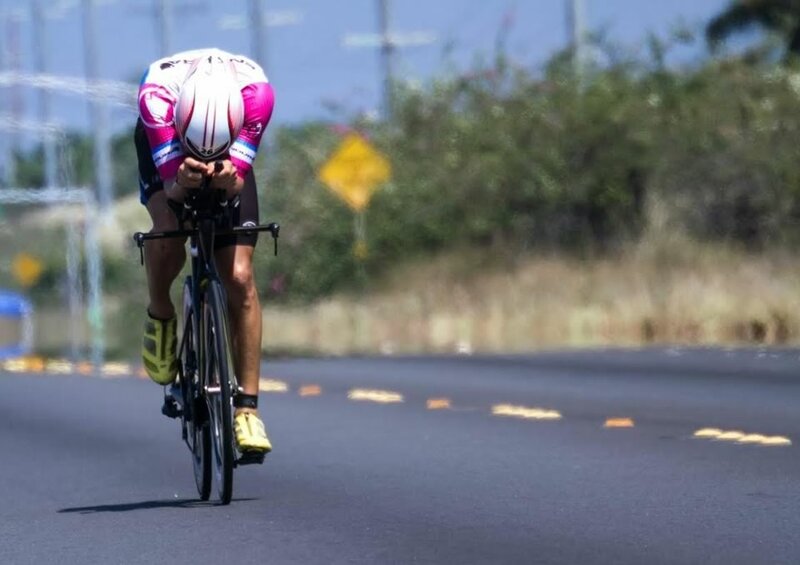 Could Joe actually break the bike record at Kona? The wind conditions were actually set up nicely for faster times than normal. Earlier in the year Joe broke the Ironman Texas bike record by averaging around 300 watts for a 4:10 bike split. So, it is conceivable that in good conditions he would be able to push 296 for an extra 8 min at Kona and grab that record as well. But, Joe also wanted to know what to expect if he went 10, 15, 20 or even 25 watts lower on race day. See the chart below that is set to 4% less power or about a 15 watt decrease to his 300 watt average. The new Time Analysis tool made this incredibly simple. Interestingly enough Joe did end up riding at a ~270 watt average for the race. Which the Time Analysis chart below equates to about a 10:45 loss in time compared to his initial model which was run at an average of 300 watts. Even though the wind conditions were favorable for fast times, the heat and humidity was very high and there were no clouds to block the sun. Consequently a 10-15% power drop was observed across the entire pro field. Below is the link to Joe's race model using his actual final power output. The time analysis tool will allow you to play with the variables to see what was possible if everything had gone perfect. 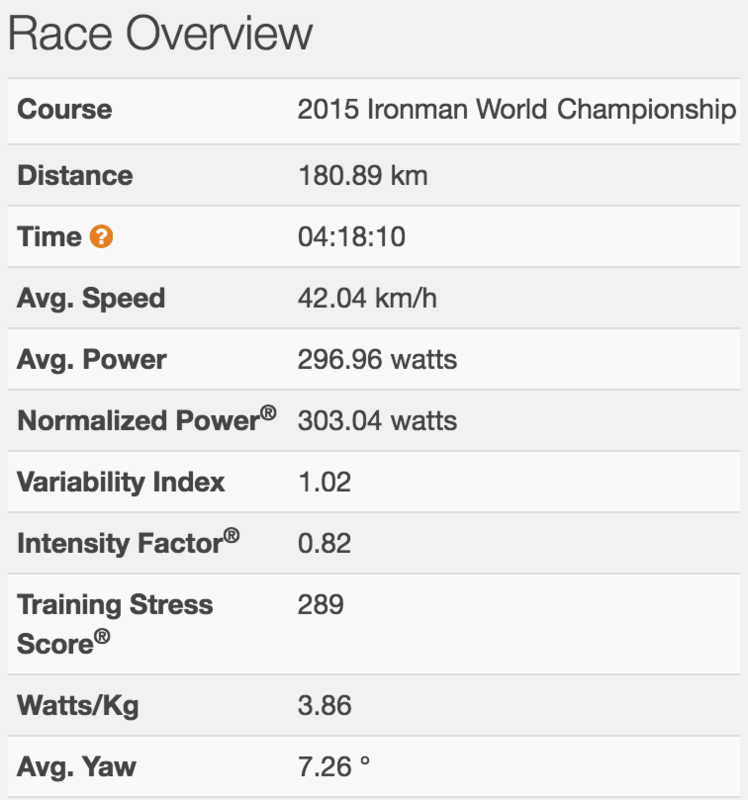 Take a look at Joe Skipper's Updated Ironman World Championship Race Plan. While Joe had a very specific power focus to his questions, we built the tool to answer many questions and "what if scenarios" that athletes and coaches have surrounding race planning and execution. While running demos in Kona we were often asked, "Where on course would it make the most sense to stretch out or to take on additional nutrition (i.e. come out of aero)?". Using Joe's race plan we can investigate this. Looking at the chart below we have increased drag by 20% and decreased power by 20%. Note segment where the red bar is shortest indicated that Joe would lose the least amount of time when coming out of aero or dropping power at these spots on the course. These sections become a list of best candidates for getting that stretch in or dropping power to take some extra nutrition. Many of these are on descents but several come in flatter sections where there is a bit of a tail wind advantage. Maybe more importantly you could also leave power at 0% and only increase drag. This would show where on the course it's most important to keep as aerodynamic as possible to minimize any time loses. Beyond just race day intelligence we hope that athletes and coaches will also use BBS and the Time Analysis tool to help with specific course selections that are best suited for the athlete's abilities and help set specific training goals for these races. Many cyclists and triathletes are very concerned about power to weight ratios. While there are of course valid reasons to track this ratio and compare, it is not the only metric that matters for race day. It is interesting to note that this year Jan Frodeno won at Kona with a respectable bike time on comparatively low watt/kg. 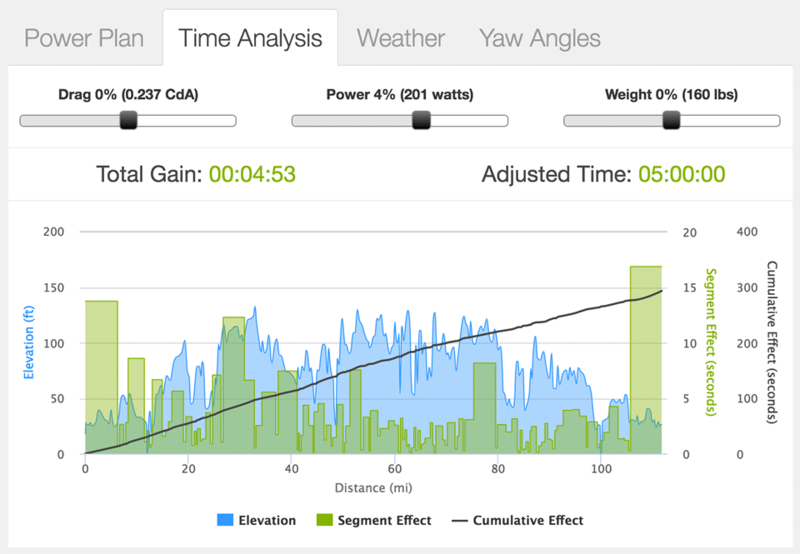 In Jan's case his great position and aerodynamic drag numbers more than made up for a slightly lower watts/kg. Drag is typically much more important than weight for almost all triathlon and time trial courses, though obviously this is not always the case. With the Time Analysis tool athletes and coaches can answer what factors are most important for specific courses and quantify what impacts changes have. We hope that athletes and coaches will use this knowledge to craft specific training goals around these three areas. Imagine an athlete is preparing for 2016 Ironman Florida, which has a fast flat course. The athlete or coach models this race with current FTP, weight and estimated drag data. The results show that if the race were today the finish time would be 5:04:53. What would it take to get that time down to 5:00 flat? With some work the athlete could drop 5 pounds (and go from 160 to 155 lbs as seen below), but that would only knock off less than 1 minute. Because this athlete is already very aerodynamic, his time is potentially better spent increasing FTP. By increasing average power on the course by 8 watts the athlete can drop his time down to 5 hours shaving almost 5 minutes. 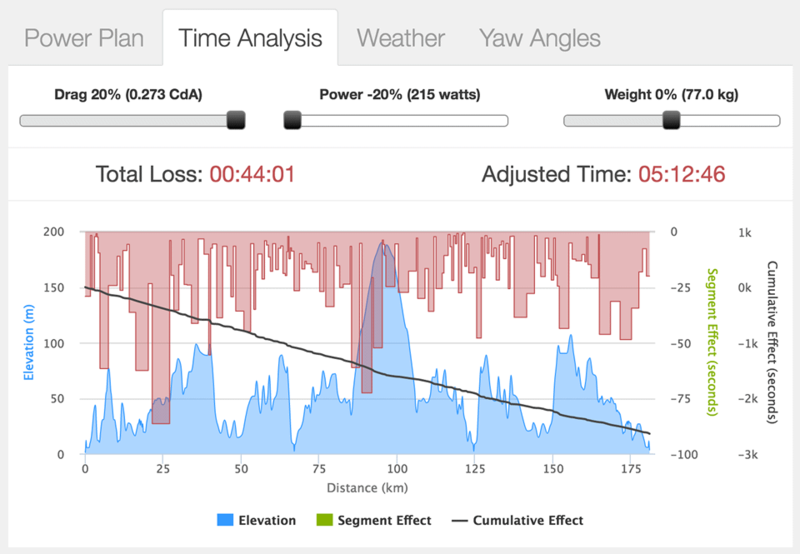 This 4% average power gain for the race actually represent an FTP gain of 5 to 6% which may or may not be possible over the training year but the tool gives insight into where an athlete can get the biggest bang for the training buck. If losing weight comes at a detriment to power gain, then for this course weight loss would take a back seat.